PROVO – Apparently Thunder goes well with rain as it was obvious early in the wet and cold state track meet Saturday at BYU that the 3A track titles belonged to the Desert Hills boys and girls teams. The only suspense that remained was if the boys team could break the 3A state team record of 161 points. In the closing events of the day, multi-event superstar Caleb Whitney picked up his fourth medal of the weekend and helped his team over the hump to a 171-point final team score. The girls team won their first state track title in school history with a score of 99, 37.5 points ahead of second-place Cedar. Stars like Abby Taylor, Olivia Leavitt, Brooklyn Lott, Hannah Morby, Jessica Bills, Tiera Orr and Kaylee Carter all collected top-three finishes. Whitney, who grabbed gold in the 110-meter hurdles and the 300-hurdles, plus silver in both the high jump and long jump, was praised by Thunder head coach Dace Goulding for his preparation, which started long ago. 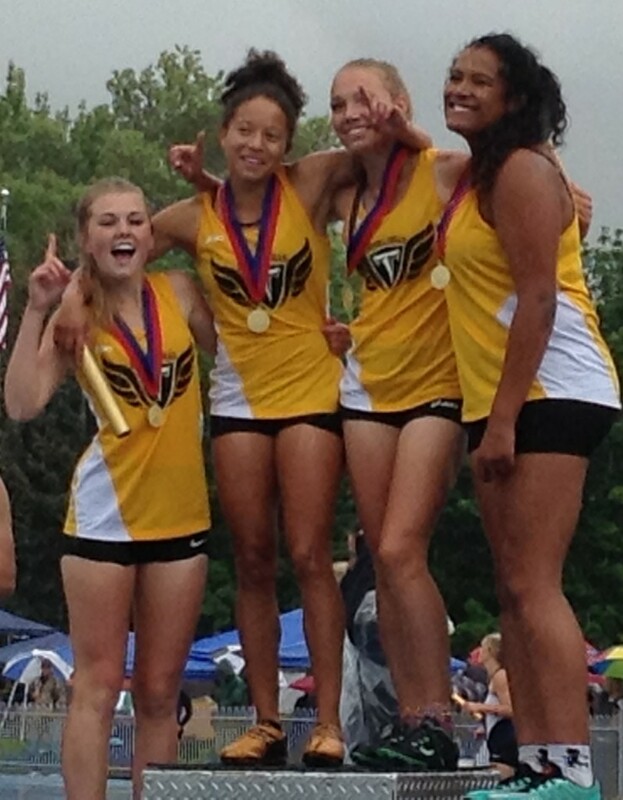 Abby Taylor won gold in the long jump Friday and ran the final leg of 4×100 girls team Saturday. Taylor pulled away from the pack in the final 50 meters of her race to help collect a gold in that event. She said Saturday’s performance has been a long-awaited day for her and the DH faithful. Desert Hills’ list of top three finishes this weekend is almost inexhaustible as the Thunder dominated 3A and often displayed better times than bigger 4A and 5A state championship schools. Jaiden Melendrez got gold in the 1600 with a 4:26 finish and another gold in the 3200 with a 9:37 time. Kale Sharp finished just behind Melendrez in the 1600 at 4:29.57 and got bronze. 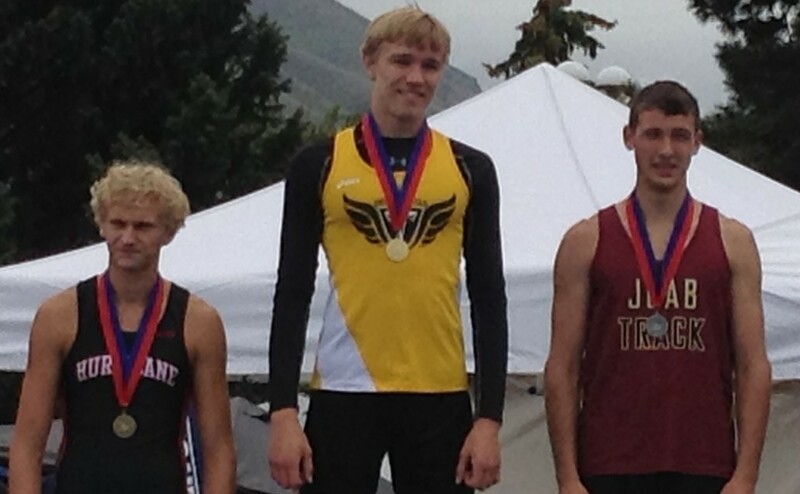 Joshua Thatcher was seven seconds behind in the 3200, taking silver. Clancy Pace won silver in the shot put with a chuck of 44-11.25. Chander Swaney won the high jump with his 6-foot-6 jump and got bronze in the long jump with his 21-foot flight. Nathan Sharp also won bronze in the 400 with a 49.76 finish. For the girls, Carter won gold in the 300-meter hurdles, finishing in 45.43. Leavitt won the 100-hurdles with a 14.65 finish. Orr added a bronze with her 4-11 high jump and Bills, Morby, Lott and Taylor did the 4×100 in 49.9 to win gold. Whitney added that hard work and expert coaching was the reason behind today’s success for Desert Hills. The Desert Hills boys and girls team are the 2015 3A state track champions. For the boys they have now won three titles in row. The girls will hang a 2015 banner as the first girls track title in school history. The Cedar girls, with 61.5 points, were second in team points. The medley relay of Brooklyn Shakespeare, Holly Carpenter, Rachael Hunt, Whitney Yardley and Julie Hunt took gold. Dixie was the next highest finisher for the Region 9 boys with 36 points, good enough for fifth at state. After DH and Cedar on the girls side, Dixie’s sixth-place finish was the best from southern Utah. For full state results, click here.